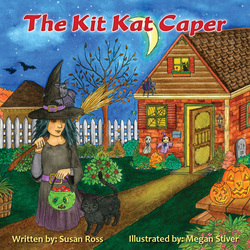 Susan R. Ross is a children's author with seven picture books. She lives with her husband, teeny tiny dog and cats. 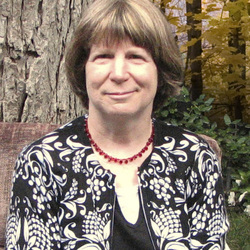 Susan is a former teacher. Her favourite part of being an author is doing author presentations for the primary division either in person or on Skype. There's a little witch treat-or-treating around the neighbourhood and she only wants Kit Kats! Everyone thinks she looks familiar but nobody guesses her identity. Who is this rather impolite little person? There are hints in the pictures and the text. A treat for children ages 4-10. Instruction on how to make a spider included. 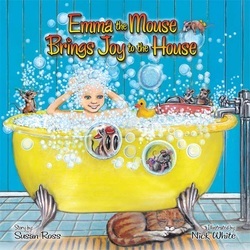 EMMA THE MOUSE BRINGS JOY TO THE HOUSE approaches the issue of hair loss from chemotherapy in a whimsical, non-threatening manner. Children who are experiencing baldness personally or vicariously through a family member or friend will find this story reassuring. 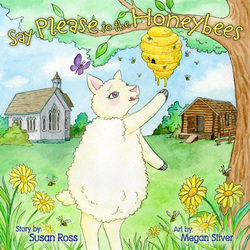 The author integrates humour into a touching tale to ensure that her pre-school and primary-aged audience will find this story as entertaining as her other picture books. Violet is very embarrassed. She's been sheared at the fair and everyone can see her BELLYBUTTON! Whatever will she do? Being a very creative and determined sheep, Violet goes about the fair finding different things to wear. Children ages 3-8 will be delighted by Violet's antics. Instructions on how to make your very own "Violet" included. Violet takes honey from the bees without saying "please." The bees are not amused and get comical revenge. Violet meets spiders wanting left-over honey, a horse named Harry hungry for honey-sweetened hay, a gaggle of geese and a snippy shopkeeper. And why isn't anyone saying "please"? 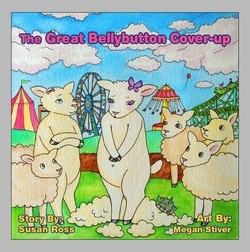 Children ages 4-9 will find this book delightful. Instructions on how to make a bee are included. Pampered Princess Rose is beautiful. Everyone wants to marry her, including Prince Sterling. Princess Rose agrees to the marriage on one condition: the prince must find her the "perfect" hairpin. That proves to be a challenging quest since "beauty is in the eye of the beholder." Prince Sterling meets a homely but kind peasant girl named Lily on his travels. As the book progresses, the prince learns an important lesson: "beauty is only skin deep" and a person's character affects the way he/she is perceived by others. Children ages 5-10 will find the horrid princess hilarious and the illustrations chock full of surprises. Instructions on how to make a crown are included. Grandma and Grandpa's little dog, Abby, is their only pet, and Abby likes it that way. When a stray cat barges into their lives, nothing is ever the same. From the moment Abby meets Tabitha, Abby knows that cat is trouble. But thiings change when the unspayed cat delivers a big surprise. Will felines take over the household? Will Grandma and Grandpa fix the problem? Will Abby change her mind about that dratted cat? Find out in DRAT THAT CAT! Then make your own cat. Instructions included.